2010 Masters in the can. 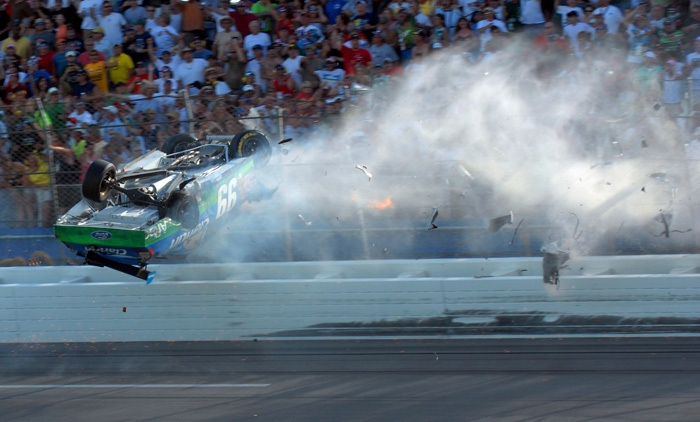 The 2010 Masters was fantastic and had a little something for everyone. From the overdramatized Tiger return story, to a true family guy persevering to take a convincing win. This was the first Masters that I’ve seen where the eventual winner didn’t win because everyone else around him fell apart, kind of “the guy who sucked least.” No, this year, it was more of a classic Masters tournament, the kind I’d heard about, where great golfers pull out great golf shots and make runs for the lead. It was exciting. The Masters really brings out the golf-liker (lover’s too strong of a word) in me. I watch highlights from the tournaments leading up to the April major, just to get myself back into the swing of things (so to speak). I also found myself sneaking a few peeks at the PGA tournament at Hilton Head this weekend, a week after the Masters. Call it a residual effect. 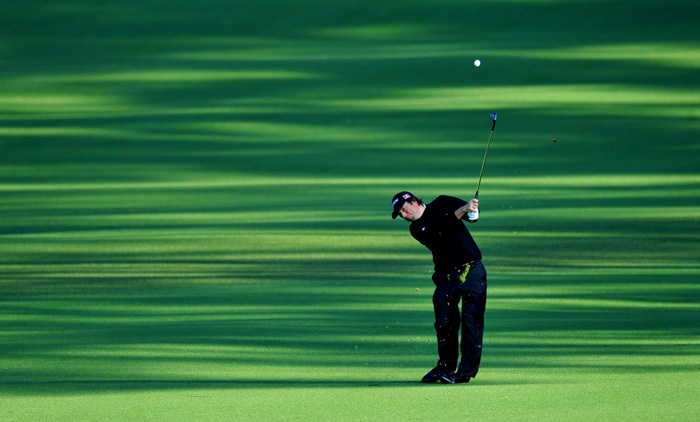 But it’s easy to understand why we (photogs) love Masters week so much. Best example comes from this Masters Sunday breakfast in the Clubhouse restaurant, paid for by the Chronicle. Not that the food’s really that great, but the hashbrowns taste just that much better when you can look out through the big oak tree from the second floor dining room and see thousands of people in their Sunday best, watching the biggest names in golf tee off in the greatest golf event in the world. It’s special. 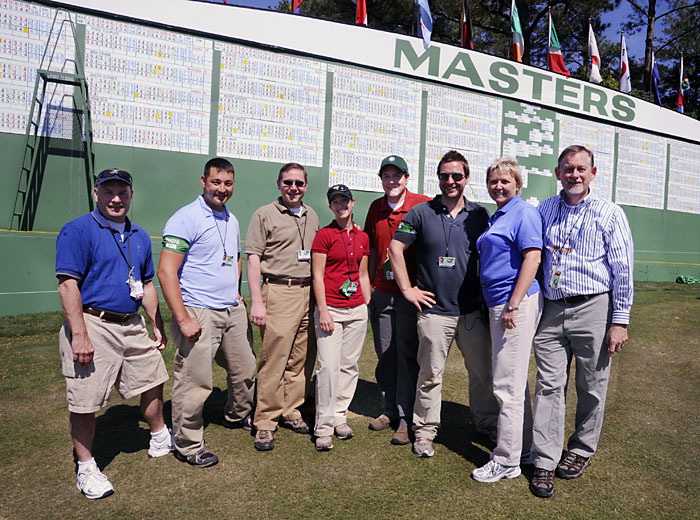 Below is our traditional Masters group photo in front of the scoreboard. We all look noticeably warmer than in previous years. 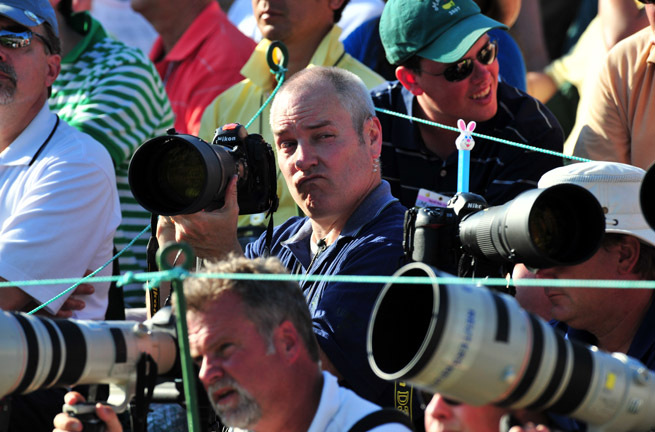 The Augusta Chronicle photo staff group photo at the Masters. From left, Mike Holahan, Corey Perrine, editor Sean Moores, Jackie Ricciardi, Rainier Ehrhardt, Zach Boyden-Holmes, Dede Smith, from our sister paper in Jacksonville, Fla., and bossman John Curry. The beauty of the Augusta National is often talked about and well documented but nothing prepares you for actually seeing the real thing. The prestine greens, perfect flowers, everything is where is should be. It’s exactly what you imagine, only they made it cooler. When people find out I cover the Masters, they always ask what its like. I always tell them two things. 1- It’s as beautiful as you think; the National does everything exactly right, or they don’t do it at all. 2-Setting foot on the course is like stepping back in time. Tradition is king. Very little changes from year to year at the Tournament. The only changes I’ve noticed in four Masters are that the fairway cross guards no longer wear yellow hard hats (ok, maybe that one wasn’t such a good decision to begin with…) and this year, the practice facilities have been built from the ground up on the old press parking lot (thanks!). The fact that there are 60-foot pine trees sitting in what was a gravel lot 10 months ago says it all. The above image is soothing to me. It brings back mental images of how the light dances around the valleys and hills that make up the National. Television doesn’t do the elevation changes justice. And the trees lining most of the fairways are simply amazing. At any point in the day, you can find a hole that has really graphic-looking shadows making for something interesting. We don’t typically use fairway approach pictures very often, and to be honest, I’m not even sure this ran in the paper but looking at it does the same thing to my brain as eating chocolate does. It’s simply pleasing to the eye. Some people say it’s hard to take a bad picture at the Masters. I look at it more like it’s hard to take a picture that is good enough and conveys the beauty that is the Augusta National.